LG Electronics said on Monday that it will begin accepting pre-orders for its 55-inch curved OLED TVs in Korea to once again show that it intends to stay ahead of Samsung Electronics in terms of OLED technology. The announcement marks the first time that a Korean company, including Samsung, has commercialized both flat screen and curved OLED TVs. 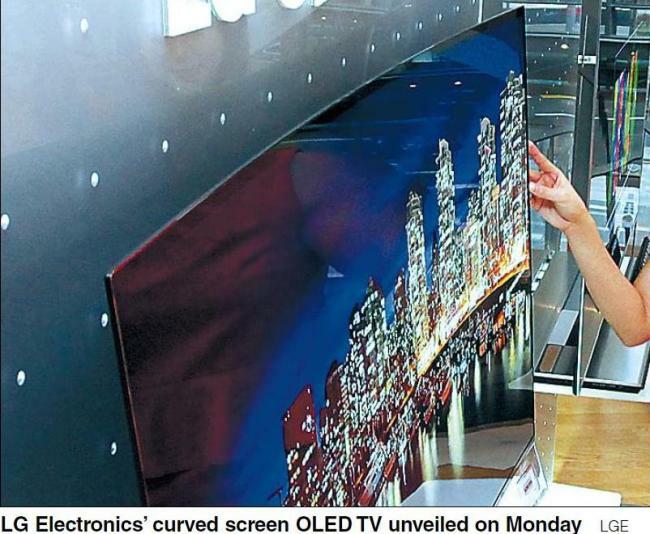 The flat screen OLED TVs have started to ship to local customers in February. Over 1,400 LG retail stores here have started to take orders on this day, the Seoul-based company said, adding that deliveries will begin next month for this flagship size model. The premium TVs are priced at around 15 million won. OLED -- organic light emitting diode -- is cited as a next generation panel technology that’s designed to be more energy-efficient and offer better picture quality. “Our Curved OLED TV is not only the proof of LG’s unmatched leadership in next-generation displays but also a testament to LG’s commitment to bringing to market the most exciting TV technology available today,” said Kwon Hee-won, President and CEO of LG’s Home Entertainment Company. LG and Samsung has been at each others’ necks over who has dominance in this new technology. LG for now, appears to be at the top as it has managed to commercialize both versions of the panels. However, Samsung has been dismissing LG’s OLED technology, and has promised to unveil its own version of OLED TVs in the latter half of this year. For now, Samsung Display dominates the small and mid-sized OLED panel market, with a more than 90 percent market share.